After the end of the Second World War, Japan, under the removal order of the GHQ (Supreme Commander for the Allied Powers), had to give up and destroy all military technology and equipment from quickly dissolving Empire. Including with this demand were all Japanese tanks and armoured vehicles kept at home and afar. Documents of old war tank projects were destroyed if they had not been burned during the fire bombings of the United States during the closing stages of the war. To replace the demolished Army of Japan, the United States enacted a National Police Reserve with the purpose of providing national security within the nation in 1950. 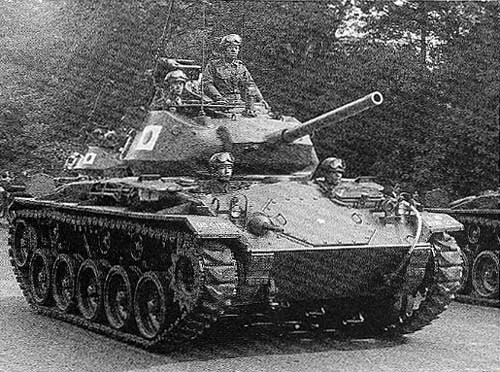 Two years after the creation of the group, the United States donated M24 Chaffee light tanks to the tank company split between each of the 4 divisions of the Police Reserve. As the tensions in the Korean Peninsula intensified, Japan came to understand the Korean M24 light tank was insufficient in dealing with the Soviet T-34/85 tank on the battlefield. In 1954 the U.S. and Japan Mutual Defense Assistance Agreement was signed, allowing Japan to ensure its own security via a National Defense Force. This gave Japan the duty to protect its country from foreign threats. When the communist threat was at an alarming high, the US provided 200 units of M4A3E8 (Easy Eight) Sherman tanks. The arrival of the M4 came with good feedback initially. However, the SDF realized the failure the M4 provided in dealing with Japan's defense requirements. The constant need of maintenance and the outdated technology in a new setting proved a hassle for the Self Defense Force. Japan had originally favored the M24 light tank as it was capable of maneuvering the hilly terrain of both Korea and Japan thanks to its light weight. It's armament was obsolete, however. Japan started to look at the US's modern arsenal of M47 and M48 tanks with their 90mm anti tank guns. However, both tanks were too heavy to adopt and that they would have failed substantially in the given circumstances. This came to resolution in 1955 as the Americans and Japanese agreed to share mutual beneficiaries to aid one another in technological advancements. The Japanese Ground Staff Office then submitted their requirements on a new tank design in January of 1955. Other ideas were present, but in the end the same goal was present. Keeping the weight low, the official project's goals were a weight of 25 tons, with a strong engine output and low ground pressure overall. Coupled with this equipped with a high penetration 90mm anti tank cannon. Provided with good depression, off road capabilities, and managing terrain such as beach heads and rice fields. These placeholder stats were approved for consideration and soon after, the Technical Research Department came together to discuss the idea. This meeting consisted of members of the Ground Staff office, Procurement Head office, and the Defense Agency Bureau Weapons Division. Added to this group was the Japan Weapons Industry Group. Guest to the meeting was Tomio Hara, the former Lieutenant General during the war. Here the decision was to have two tank proposals. The two were classed by weight, 20-25t and 25-30t. The lighter model was originally planned with a 76mm, and kept the original idea of having a light and mobile tank, favored by the Ground Staff Office. However, the advantage of the heavier design with more armour and a larger cannon tipped the balance. The idea for the 30t project was to give similar maneuverability whilst allowing better protection and firepower. When the MSA was signed and the US and Japanese lent aid to one another, Japan initially desired a loaned 90mm, used on the M36 tank destroyer. Ultimately this would add weight and make the concept of a lightweight tank hazy. Additionally, the head of the Ground Staff Office was transferred to the Technical Research Department for furthering the heavy tank plan. This effectively scuttled any proposal for a lighter vehicle to come into play. 「車重35トン、最高速度時速45キロ、90ミリ砲搭載、車高2.5メートルでなるべく低くする」 "A vehicle weighing 35 tons, provided with a top speed of 45 kmh, given 90mm anti tank gun, and a height as low as 2.5 meters." Formal construction of the ST-A1 and ST-A2 began in 1956. The ST-A1 followed the original order and was designed with a low profile, built using a test steel plating. It was completed in December of 1956. The ST-A2was larger than the ST-A1 and had a height of 2.5 meters instead of the 1's 2.2. It had an air-cooled diesel engine, torsion bar suspension, torque converter such as a power steering apparatus, and was completed in 1957. It was built using standard SDF steel. However, due to the engine not being produced and still in development the prototype was given the Mitsubishi DL10T V12 liquid-cooled diesel engine (500hp / 2,000rpm) instead. During trials of the two prototypes, both were deemed inadequate and did not meet expected performance requirements. While both had ultimately failed, the ST-A2 was accepted for further design evaluations. 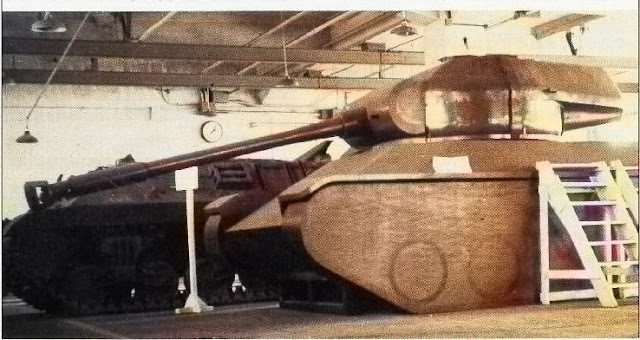 The ST-A1 prototype had low vehicle profile, but this meant that the vehicle could not traverse its turret fully to the rear without elevating the gun. Hence the length of the tank had to be extended to avoid further issues. The suspension wheels became narrower as the track length extended. This increased the ground resistance, which in return caused problems traversing. The prototype had failed the trial. With the development of the two medium prototypes. The original plan for a lightweight tank was overshadowed and forgotten. However, these new tanks would lead to the concept of a Japanese MBT rather than just a specific goal vehicle as originally sought. These are the routes that led to the creation of the Type61 Main Battle Tank. In a Part 2 I will cover the further prototype testing of the series and the service implementation of the Type61. This is really interesting! I look forward to the next part! excuse me but which designation is correct you use both the STA-1 and ST-A1 are they interchangeable or is there a error. ST-A1 is official designation. STA-1 was not. This is usually refereed to due to the theory that since STB-1 has the three letters formed (they changed it for some reason), the ST-A series had as well. This is not so. Nice job on being comprehensive on every blog-article so far (in addition to whatever documents, advice, & info you provide Gaijin with behind the scenes. Can you tell us a little bit either here in the comments or in a forthcoming article about the differences* between the STB-1, 2 ,3 ,and 4 and how they all contributed to the production version of the Type 74? Also, it would be great if you could update us on the situation of speeding-up fixes for Japanese tanks like adding more types of ammo, correcting performance/damage models, and adjusting the BRs accordingly. As always, keep-up the great work.